Avul Pakir Jainulabdeen Abdul Kalam was born on 15 October 1931 to a Tamil Muslim family in the pilgrimage centre of Rameswaram on Pamban Island, then in the Madras Presidency and now in the State of Tamil Nadu. His father Jainulabudeen was a boat owner and imam of a local mosque. his mother Ashiamma was a housewife. Kalam was the youngest of four brothers and one sister in his family. the businesses failed and the family fortune and properties were lost over time, Kalam`s family had become poor; at an early age, he sold newspapers to supplement his family`s income. In his school years, Kalam had average grades but was described as a bright and hardworking student. He spent hours on his studies, especially mathematics. After completing his education at the Schwartz Higher Secondary School, Ramanathapuram, Kalam went on to attend Saint Joseph`s College, Tiruchirappalli, then affiliated with the University of Madras, from where he graduated in physics in 1954. He moved to Madras in 1955 to study aerospace engineering in Madras Institute of Technology. Kalam met the deadline, impressing the Dean, who later said to him, "I was putting you under stress and asking you to meet a difficult deadline". He narrowly missed achieving his dream of becoming a fighter pilot, as he placed ninth in qualifiers, and only eight positions were available in the IAF. After graduating from the Madras Institute of Technology in 1960, Kalam joined the Aeronautical Development Establishment of the Defence Research and Development Organisation (DRDO) as a scientist. Kalam was also part of the INCOSPAR committee working under Vikram Sarabhai, the renowned space scientist.In 1969, Kalam was transferred to the Indian Space Research Organisation (ISRO). where he was the project director of India`s first Satellite Launch Vehicle (SLV-III) which successfully deployed the Rohini satellite in near-earth orbit in July 1980; Kalam had first started work on an expandable rocket project independently at DRDO in 1965. 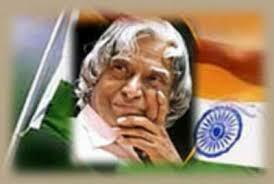 In 1969, Kalam received the government`s approval and expanded the programme to include more engineers. In 1963–64, he visited NASA`s Langley Research Center in Hampton. Kalam served as the Chief Scientific Adviser to the Prime Minister and the Secretary of the Defence Research and Development Organisation from July 1992 to December 1999. After leaving office, Kalam became a visiting professor at the Indian Institute of Management Shillong, the Indian Institute of Management Ahmedabad, and the Indian Institute of Management Indore; an honorary fellow of Indian Institute of Science, Bangalore chancellor of the Indian Institute of Space Science and Technology Thiruvananthapuram; professor of Aerospace Engineering at Anna University; and an adjunct at many other academic and research institutions across India. In 2011, Kalam was criticised by civil groups over his stand on the Koodankulam Nuclear Power Plant; he supported the establishment of the nuclear power plant and was accused of not speaking with the local people. Kalam was the youngest of five siblings, the eldest of whom was a sister, Asim Zohra followed by three elder brothers: Mohammed Muthu Meera Lebbai Maraikayar Mustafa Kamal and Kasim Mohammed. He never owned a television, and was in the habit of rising at 6:30 or 7 a.m and sleeping by 2 a.m. In the 2011 Hindi film I Am Kalam, Kalam is portrayed as a positive influence on a poor but bright Rajasthani boy named Chhotu, who renames himself Kalam in honour of his idol. A proud and practicing Muslim, daily namaz and fasting during Ramadan were integral to Kalam`s life. His father had also impressed upon the young Kalam the value of interfaith respect and dialogue. As Kalam recalled: "Every evening, my father A.P. Jainulabdeen, an imam, Pakshi Lakshmana Sastry, the head priest of the Ramanathaswamy Hindu temple, and a church priest used to sit with hot tea and discuss the issues concerning the island. On 27 July 2015, Kalam travelled to Shillong to deliver a lecture on "Creating a Livable Planet Earth" at the Indian Institute of Management Shillong. At around 6:35 p.m. IST, only five minutes into his lecture, he collapsed. He was rushed to the nearby Bethany Hospital in a critical condition; upon arrival, he lacked a pulse or any other signs of life. Kalam was confirmed dead of a sudden cardiac arrest at 7:45 p.m IST.